The full inclusion of crossbows into the Pennsylvania archery season is something I am personal very happy about. Crossbows open archery hunting to a wider variety of age ranges and provide a new method of entry into the exciting world of archery hunting. You “can” shoot any bow a long distance with accuracy and that includes crossbows, however, distance shots with crossbows even at a target are difficult due to the drop in velocity and drastic trajectory associated with any archery weapon. In addition, to compensate for the drop the arrow will take following trajectory any vertical bow and crossbow hunter would have to adjust his or her sight window accordingly. This removes the target from the hunter’s sight. This adjustment requires several feet of clear space for the arrow to remain on trajectory in order to hit even a stationary target. That is why you see distance shots on YouTube in a field and not in the woods. This scenario is particularly bad when the target is an animal and anyone taking a distance shot in the field with a vertical bow or a crossbow does not deserve the privilege of hunting in PA.
Andy hunts with a Horton Vision175 featured above when crossbow hunting. He hunts with both a verticle bow and crossbow. Crossbows may be held like a firearm and are fired with a trigger mechanism but that doesn’t mean they shoot like a rifle. A cross bow is a bow, nothing more. 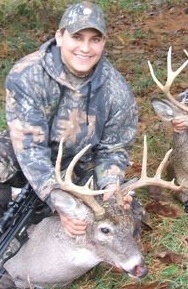 The maximum recommended hunting shot range with a crossbow is 40 yards. We at Team Surra Outdoors do not recommend a shot outside of 30yds. Today’s crossbows sighted in at 20 yards will contact a stationary target approximately 20 inches below center at 40 yards. Most sights for today’s crossbows are optical and have multi-range sighting points. This does not mean we should be taking distance shots while hunting. It is unethical to wound a deer at a long distance with a vertical bow or crossbow. The time elapsed between a release of a long shot and contact with the target gives an animal a considerable amount of time to “jump the string”. The further the shot, then the more time given for the animal to move. It is conceivable that a deer could be standing quartering away at 50 yards and be facing straight away following a shot in the time it will take an arrow from your crossbow of vertical bow to reach its destination. This unpredictable variable makes long shots in the field completely and utterly unacceptable and unethical. The last thing we want to do is wound an animal and be unable to recover it. Due to the arched trajectory that occurs with any piece of archery equipment, it is imperative clear open shooting lanes from your treestand. It heartbreaking when you realize that a perfectly aimed shot at a trophy has clipped a twig you never considered because it was hanging above your sight line. This happened to me early in this year’s archery season. That beautiful massive 8 point I had been eyeing gracefully bounced away as I was left pondering how in god’s name I missed that easy 25yd shot. 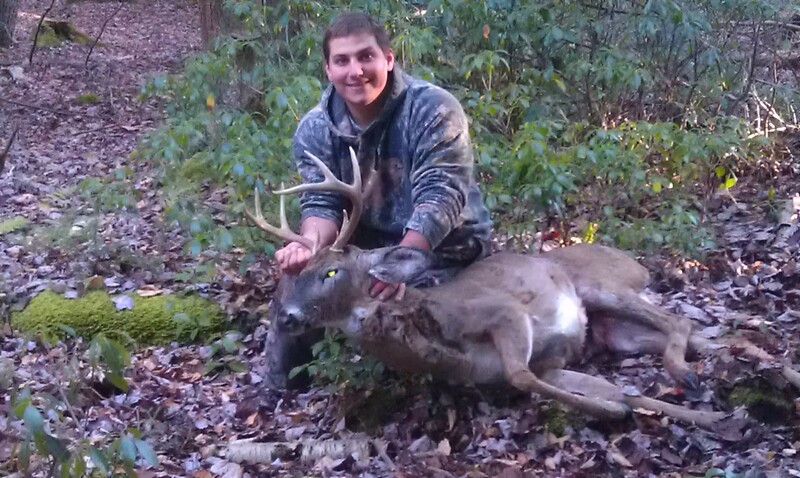 This 8 point was taken with a verticle bow in a small city suburb. Another myth associated with the crossbow is “It’s too easy”. Nothing could be further from the truth. Crossbows are more cumbersome than today’s vertical bows, their limbs (being horizontal) break from your outline and that movement can be easily seen by any deer in bow range. Crossbows are louder than today’s vertical bows and their limbs can easily hit an adjacent tree limb when fired in a tight location. The people who say crossbows are “too easy” have simply never hunted with one. Finally, crossbows or any archery weapon for that matter is not “safer” than a firearm. We need to be just as concerned with safety when using a crossbow as with your rifle or vertical bow. All of toady’s crossbows have manual safeties and should be unloaded before climbing your treestand and prior to exiting your treestand. It is imperative that we pass along our hunting tradition. Let’s make sure tomorrow hunters are safer than we are. The Pennsylvania Board of Game Commissioners expanded the lawful use of crossbows to include both the archery deer and bear seasons beginning in the 2009-10 seasons. The Board amended the proposal to including a sunset date for the expanded crossbow use that will require a future Board to vote on the measure again before June 30, 2012. There have been no negative impacts due to the implementation and expansion of the crossbow during all archery seasons. In order to allow for the continued use of crossbows during all archery seasons the PGC Board of Commissioners should not wait for the June 30, 2012 deadline to act on removing the sunset provision. From our perspective the crossbow is a useful tool in introducing young, old, disabled, female, and non-traditional (gun) hunters to the world of archery hunting. In a time when our rich tradition is at risk of falling to the ranks of irrelevance we as sportsmen need to do everything we can to increase our numbers and get more people involved. It is the only way to save our hunting tradition. We think the crossbow helps in that mission and therefore we at Team Surra Outdoors hope the PGC Board of Commissioners acts swiftly to remove the sunset provision and allow the crossbow to thrive in PA as an archery weapon. Send us your questions at teamsurra@gmail.com. Don’t forget to follow us on twitter @SurraOutdoors. Happy Thanksgiving and good luck in rifle season. Nice post, I am a hunting supporter and weapon of choice is my new barnett ghost 400.